Inconvenient new study: Canadian Arctic had significantly warmer summers a few thousand years ago | Watts Up With That? A study of chironomid remains in the sediments of Lake JR01 on the Boothia Peninsula in the central Canadian Arctic provides a high-resolution record of mean July air temperatures for the last 6.9 ka. Diatom and pollen studies have previously been published from this core. Peak Holocene temperatures occurred prior to 5.0 ka, a time when overall aquatic and terrestrial biological production was high. Chironomid-inferred summer air temperatures reached up to 7.5°C during this period. The region of Lake JR01 cooled over the mid- to late Holocene, with high biological production between 6.1 and 5.4 ka. Biological production decreased again at ~ 2 ka and the rate of cooling increased in the past 2 ka, with coolest temperatures occurring between 0.46 and 0.36 ka, coinciding with the Little Ice Age. Although biological production increased in the last 150 yr, the reconstructed temperatures do not indicate a warming during this time. During transitions, either warming or cooling, chironomid production increases, suggesting an ecosystem-level response to climate variability, seen at a number of lakes across the Arctic. Mean July air temperatures inferred from the fossil chironomid assemblages based on the WAPLS 2-component model and using the modern calibration dataset of Fortin et al. (2015) show a long-term cooling over the record (Fig. 7). Starting at ~ 0.6 ka, inferred temperatures abruptly decreased, with the coldest temperature occurring between 0.46 and 0.36 ka, then increased at 0.3 ka and then decreased until recent times. Chironomid-inferred mean July air temperature at Lake JR01 over the last 6.9 ka yr (black line) using a WAPLS-2 component model (Fortin et al., 2015). The standard error of the reconstruction is shown by light gray lines. 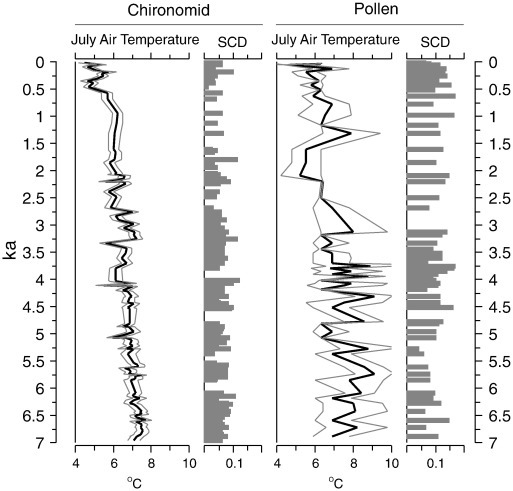 Pollen-based mean July air temperature reconstruction (Gajewski, 2015a) using pollen assemblages from lake JR01 (Zabenskie and Gajewski, 2007) and the Modern Analog Technique. Gray lines are the standard deviation of the reconstruction based on the top three analogs. The squared chord distance (SCD) of the best analog for the fossil assemblage and the modern data is shown for both the chironomid and the pollen records. 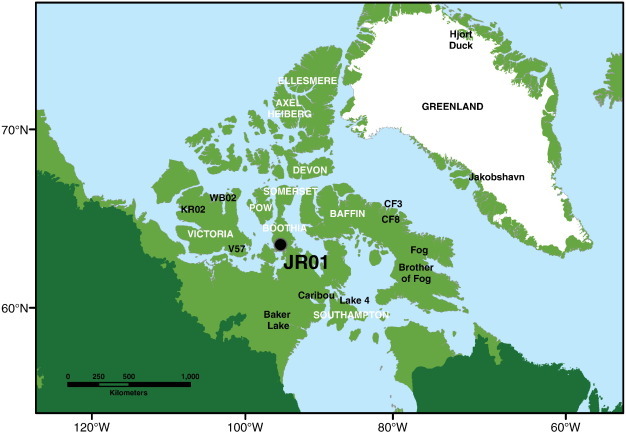 At Lake JR01 from the Boothia Peninsula, Nunavut, chironomid-inferred mean July air temperatures were warmest in the mid-Holocene, reaching as high as 7.5°C. Temperatures decreased over the course of the mid- to late-Holocene. Overall terrestrial and aquatic production, as indicated by chironomid, pollen and diatom concentrations and accumulation rates, as well as sediment organic and biogenic content, were higher prior to 5.0 ka than at any other time in the Holocene. The diatom community assemblages during the mid-Holocene also indicate that this was a warm period in the lake’s history. Between 5.0 and 1.0 ka, the lake was cooler and less productive. Inferred temperatures, based on both the chironomid and the pollen records, indicate additional cooling between 0.46 and 0.36 ka that corresponds to the Little Ice Age (LIA). Interpretation of changes in the diatom assemblages offers further evidence of a cooling at this time. Indices of both aquatic and terrestrial biological production increased in the last 150 yr, although the reconstructions do not indicate warming. Modern inferred temperatures based on both pollen and chironomids are up to 3°C cooler than those inferred for the mid-Holocene. The overall climatic trends recorded by both the pollen and the chironomids at Lake JR01 are comparable to those observed at other sites across the Arctic, offering further evidence that regional-scale climates have influenced Arctic aquatic and terrestrial ecosystems over the Holocene. Brief periods of greater chironomid production of both warm- and cold-tolerant taxa occurred at Lake JR01 at the onset of periods of climatic and environmental change, regardless of the direction of these changes. Elevated chironomid production is also seen during environmental transitions in the Holocene record of other lakes from across the Arctic. A temporary increase in production may be a consequence of the chironomid community adjustment during environmental transitions. March 23, 2016 in Paleoclimatology. What ? No begging for more money ?? Must be more real scientists ! I guess they are gambling their careers on Trump or Cruz winning ! This is interesting. These researchers are Canadian. Trudeau Jr. will be around for the next four years or so. No grants for them. My guess is that Dr. Mann will do a computer model that proves that they are wrong. I don’t think they even played hockey in the mid-Holocene, so no tree rings from fossilized hockey sticks to create a proxy. I watched a PBS science show about the earliest known human in the Americas, a 20 plus year old young woman named Eva who was found under water in a cave in Yucatan; like way under water and hundreds of yards from any entrance. Carbon dated she was 13,500 years old, and was one of a handful of full skeletons found there as clearly a ceremonial burial rite. So that cave was above water during the ice age, and used evidently only for burying folks. The point is (pun) that this woman clearly came from a people who were in the Americas hundreds of years (at least before the Clovis People. The story says that when the seas fell 400 feet during that ice age (8,000 years ago) and the land bridge from Siberia formed, it was ice free, so that the Uzbeks could leave Uzbekistan and go to America. Only problem is that when they got to North Western Canada, they suddenly encountered all of this impassable ice (hint; ice age, got it ?? ), so they couldn’t go any further overland until the end of that ice age and the Canadian ice melted. The story proposes that they in fact came all the way down the Pacific Coast in boats hugging the coast and living off sea mammals (not fish) and also eating kelp. Evidently that green kelp that grows a meter per day is very edible and supposedly even tasty (the guy ate some of it). So they came down the coast feasting on seals and kelp, at least to the Columbia, where they could finally have gone inland eventually to the Missouri, and then to the Mississippi, and on to Florida, so they could have populated the entirety of the USA and Mexico. Also supposedly, these ancient immigrants were well on their way to eradicating the megafauna, long before the first Clovis point was ever invented. They evidently used more of a round pointed spear tip, and one of those has been found in a mastodon bone. But they don’t know for sure where these pre Clovis people came from, except they are fairly sure they didn’t come down the AlCan Hiway; it was iced up. A big debate that while Asians were coming down the West coast, Europeans were coming down the east coast a bit earlier. It is theorized that some few people crossed the Atlantic along the glacier front in seal skin boats as well. I wonder if there have been any genetic studies into either theory. … I wonder if there have been any genetic studies into either theory. I like the idea that the ancestors of the present Indians committed genocide against the original European settlers. It would shut down so much activist bull crap. Right you are, those pre Clovis people were the original “illegal” immigrants across the southern US border ……. long, long time before there were such things as borders, illegals or the US. The DNA of a baby boy who was buried in Montana 12,600 years ago has been recovered, and it provides new indications of the ancient roots of today’s American Indians and other native peoples of the Americas. The “earliest known human” in the Americas is a Uranium-series dated skull fragment from the San Joaquin Valley of California. The fragment was dated by the Uranium-Thorium method very close to 16,000 years old. It isn’t widely published because the fragment was included in a collection made by a local artifact collector. The fragment was dated along with two other pieces that were approximately 11,500 years old, and accompanying megafauna bone which also dated to the upper Pleistocene. The piece is rarely discussed because it was no longer in any context that could be used. The Late Glacial Maximum was about 19,000 to 16,000 years ago (not about 8,000) and sea levels at that time were about 100 meters or more below present levels. And lastly, taking credit for wiping out the megafauna is akin to taking credit for changing the planet’s climate: very unlikely in reality. Changing the climate now is more likely than that ravenous Paleoindians ate their way through herds of elephants and bison from Alaska to Tierra del fuego. The climate and the entire planetary ecology were in motion at the end of the glacial is entire biozones were literally migrating, plants and all, to new homes. Loss of habitat is a far more serious causal agent for the extinction than hungry paleoindians. The per se “experts” will not recognize human remains found in North America that are dated at 16,000 BP simply because it would negate their Bering Sea Land Bridge Theory. And yes, during the post-glacial sea level rise of 450+ feet there were hundreds of thousands of acres of “prime” real estate that was lost …. which had to have been dastardly destructive for the megafauna as well as all the herbivores and small prey animals. I’ve always figured that the primary reason for the demise of the large dinosaurs was a “lack of food” problem. A drastic reduction in atmospheric CO2 over thousands of years is a more logical explanation than is a “sudden” demise due to an asteroid strike. This study is still built on proxy data. Study of the complete paper will show the value of the conclusions. Still, no alarmism so perhaps the data is genuine and not model derived garbish. Are they not interested in obtaining grants and promotions? This so-called science makes no sense. They do not even seem to have started with a conclusion and then stacked up their evidence to support it. Somebody needs to explain science to them – “you have to pick cherries to make cherry pie” and every hockey stick needs a blade. All they have is a handle. And it’s going in the wrong direction. Yeah, well that was a projection not a confirmed finding. Sheesh – you skeptics don’t even get the difference between a projection and a prediction!! So don't say that you weren't warned. …Dang, I really wanted his toaster !!! His death was “pure speculation” Marcus! I don’t have a toaster. I’m off grid, you idiots. I do keep explaining that. Although I am constructing a scale model of Ivanpah power station (1:50 scale) with which I plan to incinerate small pieces of bread, weather permitting. Wow real world data again shows that it was warmer thousands of years ago and that the LIA did really happen! hoodda thunk it! July temperatures are not the year. or infill the missing months of the year. You desperately need to get away from your job at BEST, so you can start being honest to yourself again. This is one of the communication problems of climate science. For years we are told that Arctic warming is a proxy for global warming. We are told that when and if Greenland melts, this means the globe is warmer. We are told that the end is nigh and we should , by now, have an ice free Antarctic and trade will flow across the Arctic ocean. Yet when some research comes up with historical warming and cooling, say the LIA, we are asked to ignore it. Science has to look at all the evidence and let the cards fall where they may. If incremental growth of atmospheric CO2 is such a huge driver of global climate, it should have swamped out the natural controls and ‘forcings’. Where variation in climate has historically occurred equivalent to today, the causes need to be found, not ignored. Its not good enough to argue that all the causes of climate change are know and accounted for and declare CO2 is the modern major driver, without building a model that shows one to be right. Until that happens,declarations of the contrary, that the science ‘understands’ climate and its proxies,just digs a bigger hole for communication and eventually for our scientific credibility. Once again the briefest whiff of reality causes panic in the climate establishment. Umm – was Yamal the world? One lake in Canada is not the world, but one Hockey Stick is? Wait a minute, the skeptics are not the ones doing the extrapolation and infilling. Don’t tell me not to infill. I’ve never infilled anything in my life. Who infilled the whole of Antarctica and most of the Arctic for 1750 to 1950. I’m just a frog who’s intentions are nice. Oh, lord please don’t let me be homogenized. Eeew! Like tewdally grows dewd! Frog in a blender. Nor is a single tree – YAD06 as I recollect – on the Yamal peninsula, but I haven’t noticed a minor detail like that bothering climate “scientists” when it comes to making sweeping statements about global temperature. Steve: What you say is true. However, it applies to all tree ring proxy data. I was counting down from 3 awaiting the “local weather/not climate argument”. I got to 2. Whereas you can cut down 34 trees, select the odd one out and extrapolate the results to cover the entire world. Good one Mosher, how many government teats are you sucking on. Neither is one tree in the Urals … but look at the fuss it caused. OK, lets take a look at an area more than 3,000 kilometres distant, to the northeast. A 1977 ice core from the Hans Tausen ice cap in northern Greenland provided conclusive evidence that the world’s northernmost ice cap melted away ENTIRELY during the Holocene Optimum, demonstrating that Greenland was substantially warmer during the HO than it is now. I am responding to the comment. Psst. February is not a year it’s one month tell your friends that ! Mosh, global SL at this time were higher then now! Think about it, study the literature before you type. Anthony, Steve can read, just look at what he commented. So if the Arctic goes ice-free next year we can’t take it as evidence of global warming? Mosh ; in-filling other seasons are you ? During the period of maximum forest extension, the mean July temperatures along the northern coastline of Russia may have been 2.5° to 7.0°C warmer than modern. The development of forest and expansion of treeline likely reflects a number of complimentary environmental conditions, including heightened summer insolation, the demise of Eurasian ice sheets, reduced sea-ice cover, greater continentality with eustatically lower sea level, and extreme Arctic penetration of warm North Atlantic waters. The late Holocene retreat of Eurasian treeline coincides with declining summer insolation, cooling arctic waters, and neoglaciation. Isn’t this pretty much what we’d expect? The high latitudes would have received significantly more insolation 5k-7k years ago due to the obliquity of the earth. Isn’t this what caused the Holocene climate optimum? Yes it was – the HCO, and why Canadian summer temps were warmer then than now. The conundrum of unintended consequences: So called Canadian scientists were screaming and yelling about conservative “muzzling ” of aforementioned. Seems that real scientists now have a better chance of getting published because the unreal ones are having to back up their idiotic claims. The unreality of it all. They’ve always been allowed to publish in journals. They just couldn’t talk to the media or issue a press release without a permit from on high. Such a pity that Stephen Harper, who got almost everything else right, just couldn’t stomach the idea of the public knowing what their government was doing. Especially of course his approach to climate change “Do nothing at all and say almost nothing”. He did make a commitment to reduce fossil fuel usage by 2100 though. My understanding was they wanted to be able to complain to the media that the Canadian government wasn’t doing enough to “combat climate change”. If an employee of a private company insisted that s/he be allowed to criticize his employer’s budgets, spending, plans to the media what do you think would happen? “Rock Snot” Max Bothwell was the Environment Canada researcher that became the poster-child of “muzzled scientists”. He is on the record as saying that, in fact, his interview was not denied but approval was not granted within the 48 hours that the journalist deemed the story newsworthy and so, she lost interest in pursuing it. The work on lake bed sediments has always been an insult to “unprecedented catastrophic climate change” by demonstrating that we are not in possession of the keys to predicting which factors are essential to relatively rapid ecological evolution. CO2 concentration certainly is not at the top of the list. What is going on here ? Two papers published no begging for more money with DATA and not GIGO models , Some are getting scared of your election ! 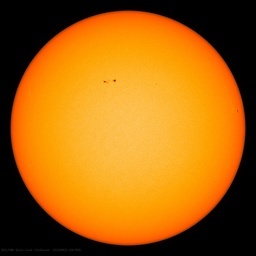 Yes John Finn that’s correct – something like 5%-10% greater Northern Hemispheric summer insolation at 6ky bp. If a tree falls in the forest and there’s no Warmist “scientist” there to sample it, is it still lying? Mann’s claim to fame was constructing a stick out of bristlecones and falsely pretending that it was supported by multiple proxies and that it had statistical “skill”. Remind me – what was Steyn’s word for it? …what was Steyn’s word for it? Poor Mosh.. looks like the AGW disease is incurable in him, especially while on the BEST teet ! I was near JR01 in July 2014 and photographed old clam beds near Taloyoak in a freshwater lake…Middle Lake. The clams apparently were not fossilized so a few hundred or a few thousands years old. Had to have been way warmer way back then. Took a few photos out of curiosity. As l suggested in a other topic l think Hudson Bay area is the “canary in the coalmine” when it comes to climate change in the NH. Because clearly it was joining in with the warming then this warm period was at its peak, This is why l think its worth noting that this part of the world has not been joining in with the current warm peak. This suggest to me that this current warming is not for the long term as the AGW crowd like to suggest. Nice to see some science without any finger wagging. Notably, these biological proxy Holocene temperature reconstructions are very much in line with those from GISP2 ice cores in Greenland. I just chanced upon this analysis of the temperature of Antarctica for the last 200 years. Can someone else have a look at this and tell me whether the results justify the conclusion. It’s frankly the damndest thing. The graph in the paper of temp anomalies from 1800 shows slight cooling until 1900, then a return to approximately the starting conditions and not much of note overall. Also, no similarity with the trend of the instrumental record shown alongside (apart from some similarly placed wiggles). But they seem to have rejected the evidence of their eyes and determined that their findings support an assumption that Antarctica will warm along with the rest of the world. I saw a film a few years ago of an Arctic subterranean research station where the climatologists had dug a big man hole down to get samples of ice from old sediments. They waxed lyrical about how disastrous the current situation regarding climate was while they passed down through a tangled mass of tree roots and stems showing that large trees had once grown in this now treeless region. I laughed and did not record the details. Does anyone know where it is and whether it is Canadian or American? And are there tree deposits in Northern Greenland? Some of my friends claim there are. I’ll bet there is coal in the Arctic. Of course there were trees. For all we know there were woolly giraffes eating them. There were also Camels in the arctic area ! there is , and it is constantly burning . there is film from a survey/tourist voyage (quite possibly on wuwt somewhere) showing exposed seams burning away adding lots of lovely co2 to the atmosphere . I think you are referring to is Smoking Hills, discovered in 1826 by explorer John Franklin. B-B-But three degrees warmer is well into the tipping-point disaster-is-upon-us end-the-economy and snuff-the-kids territory. I am amazed this got past the ‘peer review’ process. Downright subversive. What a wonderful find. This confirms the global nature of the Minoan Optimum, which together with the Sahara savannah of the period, shows that warming is really good for children and other living things (OLT). It also explains why there was a population of Inuit living at the NW corner of Greenland where it was ice-free in summer, not like now. I noted that it took 6 months from submission until acceptance instead of a couple of weeks like many team papers. Well spotted. I guess they couldn’t find anything else the authors were willing to concede. These must be real scientists doing some real investigations. NOAA and GISS will not be happy with them, as their coloured in charts show that the Arctic and Canada are heating up catastrophically and on a tipping point! Their homogenisation shows it clearly hotter, despite their having no measuring stations in the area. The scientists will have to hope that Ted Cruz or Donald Trump wins the presidency. Why didn’t the poorly adapted polar bears die off during the Holocene Optimum? How could they have survived the all the warm temperatures periods over the last million years since they evolved from the brown bear? I understand the “endangered” polar bears are under such stress today that they’re breeding like mink, according to Dr. Mitchell Taylor & Dr. Susan Crockford. Someone please explain! The Polar bears refused to die out of pure meanness. More “Evidence” that man made climate change is nothing but a con job and the fact that 97 percent of scientists would have you believe otherwise makes you think if there not in it for science what are they in this field for ? It’s not more evidence though is it? The reason for warmer temperatures in the high latitudes is well understood. It’s due to orbital forcing. The results of their work are interesting but couldn’t they have given the lake a name? Even Lake Sink the Models is better than nothing. When Suzuki gets hold of this report you guys are toast. He’ll be running to the CBC and the socialist Liberal gov’t demanding your arrest. One of today’s (3/25/16) alarmist theories. Have a nice Easter, to you and to your readers!